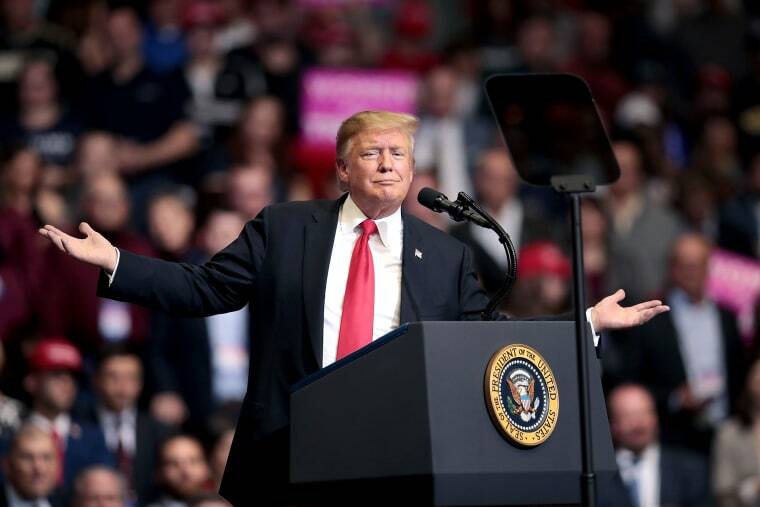 Analysis: At the president's first rally since the attorney general announced he wouldn't be prosecuted, Trump went on offense against Democrats and the media. WASHINGTON — President Donald Trump identified the enemies of his state Thursday night. "The president is absolutely trying to reinforce the feeing among his allies and surrogates that the media went overboard in its coverage of the Russia investigation, that certain lawmakers were reckless in their claims, and that the investigation itself was flawed in its inception," said Bradley Moss, a Washington lawyer who specializes in national security issues. "The problem here is that even if the president has legitimate gripes on one or more of those things, his overly aggressive commentary is doing nothing but exacerbating the situation," Moss said in a text message. "There were real and legitimate red flags that justified the investigation. Lawmakers had real and legitimate bases for viewing the existing evidence as reflecting collusion." The contents of Mueller's full report remain a mystery not only to the public but to the lawmakers who oversee the Justice Department. Yet even Barr's brief summary acknowledged what Trump has been so unwilling to admit himself: that Russia tried to help him win the presidency. "The Mueller report and the two conspiracy indictments against a host of Russians confirm that Russia's attack on our 2016 presidential election is no hoax," said Kim Wehle, a law professor at the University of Baltimore who worked for independent counsel Kenneth Starr in the 1990s. "If he respected the office, the president would be calling for accountability for Russia for the safety and security of the United States." Instead, Trump cast doubt on Russia's role in the election again Thursday. "All of a sudden I hear review involved with Russia? I said, 'Russia? What the hell does Russia have to do with my campaign?'" he said. "You know, I go up to Wisconsin, where [2016 Democratic nominee Hillary Clinton] did not go." It's impossible to know exactly how much influence Russian activities had on the election — as compared to the candidates' messages, their strategies and tactics, the long-running investigation into Clinton's email and other factors — but Trump has been aggressive in denying that Moscow even tried to interfere. "President Putin says it's not Russia," Trump said as he stood next to the Russian leader at a press conference following their Helsinki summit last summer. "I don't see any reason why it would be." A day later, after a backlash from within his own party over his rejection of the intelligence community's findings, Trump tried to clean up his statement by contending he meant to say he didn't see any reason why it "wouldn't" be Russia. But over the course of his presidency, he has shown a deep sensitivity to the suggestion that Russia meddled — even short of collusion with his campaign — perhaps because of the possibility that such an admission could cast aspersions on the legitimacy of a victory of which he is proud. On Thursday night, much of his rhetoric was aimed at re-living that win and painting the Barr letter as a validation. "After three years of lies and smears and slander, the Russia hoax is finally dead," Trump declared. The collusion delusion is over. The special counsel completed its report and found no collusion and no obstruction ... Total exoneration. Complete vindication." Never mind that the Barr letter didn't say the special counsel found no obstruction. It said Mueller's report "leaves unresolved" whether "the president's actions and intent could be viewed as obstruction" and that Mueller states "while this report does not conclude the president committed a crime, it also does not exonerate him." But Trump's speech was forward-pitched, too. His attacks on Schiff, Nadler, the media and others appeared to be designed to undermine the institutions and players that still have the ability to pursue leads uncovered by Mueller and to probe activities unrelated to the Russia investigation. "Our separation of powers requires congressional checks on the presidency," Wehle said in an exchange of texts. "It's what ultimately protects the rights of individuals against an overbearing government. It's sad that this is not our uniform message." In Trump's telling, he was the little-guy target of a powerful government run amok. "In this country, we cannot criminalize political differences," he said. "We do not abuse the law enforcement and intelligence power to target our political opponents, where they spy on me. Who ever heard of this? They spied on me. They spied on my campaign." When his adoring fans chanted "Lock them up" Thursday night, Trump silently soaked in the moment.